Wonderland: Alicein Poetry shortlisted for CLiPPA Award for poetry 2017. Reaching for The Stars: Poems about extraordinary women and girls also shortlisted for awards. Both poetry collections published by Macmillan. Birmingham Libraries' and Surrey Libraries' Award. Visit www.michaelamorgan.com to see all the latest news about children's author and poet Michaela Morgan - now twice shortlisted for the Blue Peter Book Award! There are performance videos of poetry, details of her latest school visits, trade books, education books, books for teachers, reviews - everything you might need. See the web site for a full range of the latest books, reviews and testimonials. I like visiting schools! I am particularly keen to work in Midlands, Manchester, London , Brighton and Edinburgh areas but will consider travel anywhere. 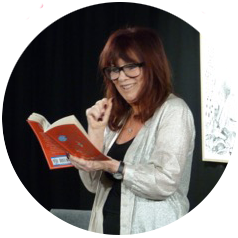 I work with the whole age range from nursery to Y6, and am happy to share my stories, give hints for writing, perform poetry and run writing workshops. I have worked in hundreds and hundreds of schools all over the country and abroad. I also talk to teachers and parents. I have spoken at many teacher's conferences and run Inset days. "Thank you for bringing reading magic to our school. Your wonderful workshops have inspired children and staff, and in each class room I can see children excited to continue the work you have begun. The children and the staff are buzzing!" Shireen Babul, School Librarian, Chalkhill Primary, Brent. Michaela visited our school last July and worked with Nursery up to Year 5. The children loved listening to her stories and learning all about the ‘writing process’. When it came to their own writing, they were highly motivated and enthusiastic and couldn’t wait to get their ideas down on paper.The teachers were full of praise about the visit and felt that Michaela’s approach to books and writing was very inspiring! Jane Dearlove KS2 English and Drama Co-ordinator, Kent College Prep. I have written over 140 books including poetry, picture books, fiction, non-fiction, early readers and junior novels. Lewis Carroll's verse and contemporary poets' response. a NEW story in the popular Sausage series! Which special person is arriving? A lift-the-flap picture book. Can Kitty Kool's magic help a ragged rabbit, a silly spider and a cranky croc?